An old friend of Michael's, who has become a successful artist, invites the entire Ivey family to his beach house. But their vacation is not all fun-and-games. It appears that someone is out to get the artist; and the Iveys and their friends keep stumbling upon clues to the tangled mystery. Rags is up to his old klepto tricks, and it's a good thing because, not only do his uncat-like antics prove to be amusing, he manages to save two lives. Join the hilarity and suspense as this mystery unfolds. Enjoy some of your favorite human and animal characters as well as a few new ones, all of them giving this story a light and rich quality. The Gallery Cat Caper is available now for Kindle at only $2.99 at Amazon. 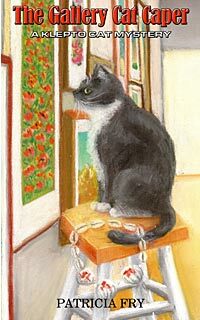 Purchase the paperback of The Gallery Cat Caper here at MatilijaPress.com.